The Brushless Motor A for Q500 from Yuneec is a clockwise rotating motor that can be installed left front or right rear. 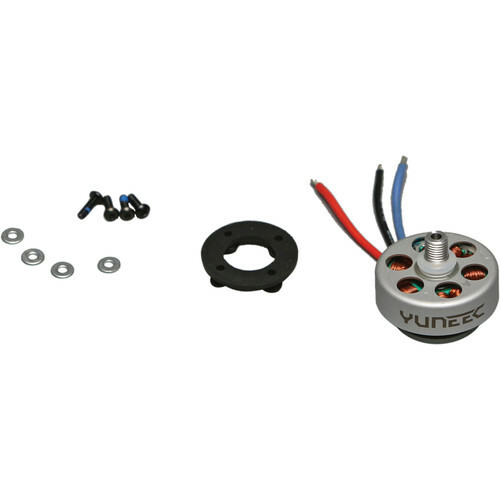 Box Dimensions (LxWxH) 4.1 x 3.8 x 0.4"
Brushless Motor A for Q500 (CW Rotation) is rated 5.0 out of 5 by 1. Rated 5 out of 5 by Merchant from Replaced stripped threads on Q500 4K with no soldering My Q500 4K somehow had worn out the threads on one of the A motors. With this replacement motor, instead of replacing the whole motor and having to solder to the circuit board, I took both motors apart and replaced the half that the threads are on. Remove the little c-clip on top of the motor, a couple washers, then just pull (hard) the motor apart (it's only the magnets holding it together at that point). Swap the top half of the motors, put the little c-clip and washers back on, and it's fixed!